Hardwood floors a the ultimate choice for elegance and grace within your home. These wooden floors are almost neck and neck with carpeting as the most sought-after flooring surface in the country. However, hardwood wins out every time. There are a number of reasons for this, but most often, our customers speak about how the wood boards can battle back from even the worst of damage whereas carpeting has a short lifespan and is extremely vulnerable. With a wood floor sanding in Bergen County NJ, not only do we remove all blemishes, cracks, splits, tears, and other damage, we bring you a new floor at a fraction of the cost. At Majestic Floors, we are committed to your satisfaction and the appearance of your hardwood floors. Our wood floor sanding professionals are equipped with the knowledge, skills, and equipment to rejuvenate your floor's appearance without delay. We use a dustless sanding system "99.9% efficient at capturing dusts as small as .5 microns", leaving you with minimal cleanup once we've completed restoring your wood floor. Hardwood floors already have a proven lifespan that can go on for decades before you notice any damage. However, in the hustle and bustle of every day life, we can't promise that our floors won't be damaged over time. This can be as simple as moving furniture and leaving scratches or something serious like dropping something heavy onto the boards and leaving a huge crack in the middle. No matter the severity of your damage, there is hope with our professional wood floor sanding in Bergen County NJ. What we do is simple. We sand down the floor and remove all of these mentioned cracks, tears, splits, and other problematic areas. Then, you have free reign to create a new floor as you see fit. If you enjoyed the look and feel of your current hardwood design, no problem. But you may also opt for changing the color, tone, or texture. These are reasons for wood floor sanding in Bergen County NJ, even if there is no damage to the hardwood as you currently see it. The process is quick, easy, and won't cost you a fortune. One of the issues with replacing a floor, besides the increased costs, is also the waste, manpower, and length of time it takes for the installation. All of these are non-issues with our service. Call us now and see what we mean. For more information about wood floor sanding in Bergen County NJ, call Majestic Floors at (201) 739-1145. A wood floor is a terrible thing to waste. In truth, nobody has ever uttered those words, at least not to us. That is because it's almost impossible to waste hardwood boards. Even under the biggest of disasters, the floor boards can find new life. This is possible with wood floor sanding in Piermont NY, bringing the most out of your preexisting floor. Majestic Floors enhances the appearance of your wood floors with professional wood floor sanding in Piermont NY. Our experts are knowledgeable about many types of woods, the treatment each requires, and how to promptly rejuvenate its appearance. We are committed to your satisfaction, using dustless sanding methods efficient at capturing "99.9% of dust as small as .5 microns." We achieve beautiful results with minimal clean up - allowing for immediate enjoyment! Hardwood is a very durable material. Let us show you what we mean. We know what you're thinking. You're looking down at your floor and wondering how it's possible that it can be repaired. It's not only possible, this is one of the top reasons why you should always choose hardwood over any other flooring material. When other floors get chipped, cracked, dented, and worn out, there's no other option besides tossing them in the trash and getting a new floor. With hard wood floor sanding in Piermont NY, you can get a new floor and still keep your old floor. How? Well, we sand down the floor and remove all of the imperfections. This gives you a new base upon which to build the new floor. After the sanding is complete, the refinishing job will give you a brand new hardwood foundation. At this stage, we can also take precautions in making the floor boards stronger and more durable to avoid any future damage or wearing down. Another great element about wood floor sanding in Piermont NY is the freedom it gives you to find a new design you'll truly enjoy. What this means is you can change the color at this stage, make it darker, lighter, or even the texture under your feet. Remember how we said earlier that hardwood is almost invincible? Well, this is how it's done. Contact us today and let us show you how ready your floor is for improvement. You'll be so amazed, you may think we installed new floor board while you weren't looking. That is, until you see the bill and realize it was only a floor sanding. For more information about wood floor sanding in Piermont NY, call Majestic Floors at (845) 356-1144. Your dream home is incomplete without the perfect floor. That's why you selected hardwood floor boards. They feel great under your feet and look great to your eyes and the vision of any guests you invite into your house. However, like all things, the wood boards may wear down or take damage as you live your busy life. You may be looking at the floor right now and wondering when you should call a team to reinstall your floor. You don't have to. With wood floor sanding in Ramsey NJ, you can bring the existing floor to its former glory. Or even better, change the design or make preventative measures to protect the hardwood from any future damage. 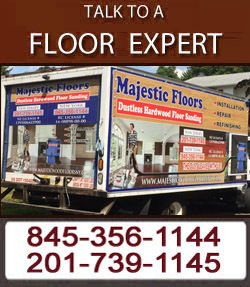 Majestic Floors services Bergen County residents with exceptional wood floor sanding methods, dustless wood floor equipment, and expert knowledge about many styles of hard wood. Our professionals approach wood floor sanding in Ramsey NJ with a keen eye, working hard to restore your floors to appearances rivaling a fresh installation. Whether you are looking to begin Spring Cleaning with your floors, or find they don't complement your home quite the way they used to, our professional wood floor sanding specialists will rejuvenate their appearance and update your home without installing a single board! Wood floors are so popular because they are incredibly easy to install, replace, and remove. But more than this, these floors are also incredibly easy to repair in the event they take damage. And how can they not find scratches, dents, rips, tears, and more? You have a life to live in your home, of course. But damage isn't the end of the world. We can come into the home and promptly deliver quality results. And all without ever having to remove or reinstall anything. We perform wood floor sanding in Ramsey NJ without delay, removing scuffs and blemishes that hindered your floor's appearance. Likewise, our wood floor sanding service will increase your home's natural lighting due to your floor's restored reflection, as well as better air quality due to the release of trapped bacteria, dirt, and grime in your floor boards. But another benefit of sanding is the ability to change the existing design. If you want a darker hue, a lighter tone, or even a more polished feel, your options are limitless. Sanding will give you an open canvas upon which you can create a new floor. And again, you won't have to dish out a large sum for new materials. For more information about wood floor sanding in Ramsey NJ, call Majestic Floors at (845) 356-1144.